Trying To Beat The Cold Weather! So, I am freezing to death. I really think I am. Ok, not really, but it feels that way! I broke out in hives on Monday night and I think it is a reaction from the cold. It came out of nowhere. My skin was burning and itching all over. This happened one other time about 5 years ago and it was when we got a cold snap. I had no other antihistamines in the house except Benedryl and it has lactose in it. I had to take it. The illustrator offered to go and get me something else, but I was in need of something then and it was too late to go out looking for allergy medicine. So, I took it. Ugh, my stomach has been a mess for days now. Funny how some things like that stick with you for so long...not funny ha, ha though. So, I looked up hives to get a little more information and you can get them from food sources, but you can also get them from the cold. I am only assuming that is the problem, but it sounds pretty accurate to me. This time of year my asthma acts up too (I am a treat right now!). I have been taking my good old standby Alavert, so things are getting better. Not completely gone, but better. In addition to the allergy medicine, I have been trying to eat things that really help keep you warm and help you feel better. 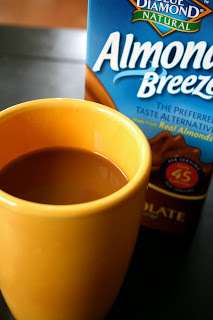 After my review of Almond Breeze a while back, I was told by a friend of mine that the chocolate version is amazing. So, the illustrator and I decided to give it a try. Wow, that stuff is so good! Too good if you ask me. I don't normally drink my calories, so I was a little worried about liking that one so much. I came across a less sweet version of the Chocolate Almond Breeze on sale and thought I would give it a try. I like being able to control the amount of sugar I am drinking. With only 45 calories a cup, I decided to try it out. It is not as sweet at all, but it still has the nice chocolate flavor of the sweetened version. I can't have the mochas or anything fun at the coffee shop any more, so I decided to try a version at home. I love mixing my coffee with this stuff! So, good! I sweetened it up a bit with some NuStevia (more on that later-love this stuff) and I have my own mocha coffee in the comfort of my home for way less money than the coffee shop! After seeing HEAB mention the Chocolate Almond Milk the other day, I remembered I had some in the pantry. This definitely helped me warm up by the fire yesterday! I have also been craving blueberries lately. Which is weird, because they really aren't my favorites in the fruit category. My in-laws brought us a few bags of frozen blueberries about a month ago, so I decided to change up my oats today. My phylosophy is, when you are craving something like that...you probably need whatever is in it! It was so good. 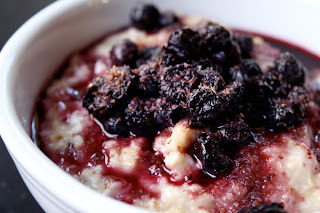 Yesterday, I mixed the blueberries in the oatmeal when I cooked them. Today, I microwaved them for about 35 seconds and poured them on top. This really hit the spot! I sprinkled a little flax meal on there too for an extra boost! I was absolutely going to start this day off better! I had my usual salad today, but with a quinoa bean burger that I was working on. The burger tastes delicious, but I need it to hold up a little better before I share that recipe. I keep a stash of homemade bean burgers in the freezer all the time. I absolutely love them! This was the first time I made them with quinoa, so I have to play with it a little more! I was trying to add more protein to the burger. Hopefully all of this good stuff will kick the hives outa here! So sorry to hear about the hives - hope you are feeling better. Glad you found the less sweet version. Not sure that would fly with Chris since he loves that the regular version tastes like yoo-hoo! 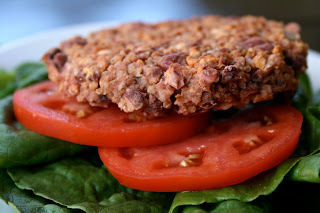 The quinoa Burger looks amazing, can't wait until you post the recipe! my skin is also super sensitive -- isn't cold weather the worst? !